This camera's ease-of-use makes it ideal for first-time security camera users. Vimtag isn’t a household name, but the 17-year-old company’s security cameras and accessories have amassed some pretty stellar reviews on Amazon.com. After putting the its P1 Smart Cloud IP Camera through it’s paces, it’s easy to see why. While it doesn’t sport a particularly arresting design or boast bleeding-edge features like facial recognition, it easily stands with our favorite security cameras thanks to some solid technology and and an excellent user experience. The Vimtag P1 follows what are now well-established design cues for DIY security cameras: an inoffensive pod-like body in a white finish that can be placed on any tabletop surface. While it can be inconspicuously nestled within a bookshelf or between knick-knacks in an entertainment center, it comes with a couple of screws should you want to, say, mount it upside down on your ceiling. The P1 has pan-and-tilt functionality—350 degrees horizontally and 90 degrees up and down—that you control from the Vimtag mobile or browser app. This allows you to adjust the camera’s position on the fly or even remotely follow a moving object as you monitor your feed. The 70-degree viewing angle is on the narrower side, but it's still plenty for monitoring a small living room or business reception area. Image Resolution is up to 720p, and night vision is supplied by two 940nm infrared lamps for a viewing distance of about 26 feet. The Vimtag P1 Smart Cloud IP Camera features motion detection, pan-and-tilt functionality, and two-way audio. Unlike most IP security cameras, Vimtag’s P1 doesn’t come with a cloud subscription offer. Instead, your video recordings are stored locally on a microSD card (not included). The P1 supports up to 64GB of storage this way, and that’s probably plenty if you’re recording only motion-detected events when you’re out of the house. If you require 24/7 recording because you own a business or take extended vacations away from home, you’ll need more. For that, Vimtag offers the $150 S1 Cloud Box, a 1TB internet-connected hard drive that can handle up to four camera feeds simultaneously. You can connect the P1 to your network via either Wi-Fi or your hardwired LAN; however, the camera doesn’t have a built-in ethernet port. Instead, it comes with a curious adapter that includes both an ethernet jack and a power port. If you are connecting wirelessly, you can just plug the power cord directly into the base of the unit—no adapter necessary. 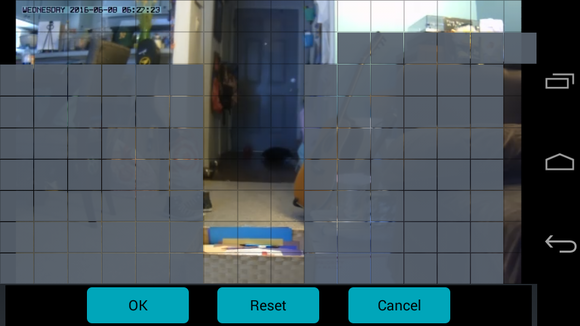 As I used the second method, I added the camera using the Vimtag Android app, which required me to create a login, then scan a couple of QR codes—one on on the P1 and one within the app. I was up and running in minutes. Out of the box, the camera can only take snapshots, which it saves to your device. 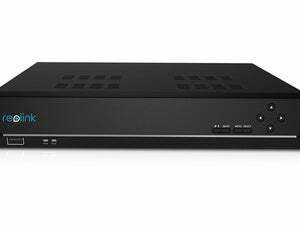 To record video you’ll need either the aforementioned microSD card or the S1 Cloud Box. The former you just slide into a slot on the side of the camera. To use the Cloud Box, you connect it to your router, then navigate to Storage in the settings screen of the Vimtag app to add it. The camera connects to it wirelessly. You can have motion detection trigger photos or video and set day and night sensitivity separately. Even if you’ve never used a home-security camera before, you can easily find your way around the Vimtag mobile app. The camera’s live feed appears on the main screen, and below that are four easily identifiable icons. The first two allow you to manually trigger a video recording or take a snapshot, respectively. A microphone icon lets you activate two-way audio. This is a great feature if you want to listen in on or speak to the kids or pets you’re monitoring at home. In a worst-case scenario, you can use it to startle an intruder. The final icon gives you access to image settings and the camera mode—you can toggle between day and night vision or set it to auto. This layout is mirrored in the web app. 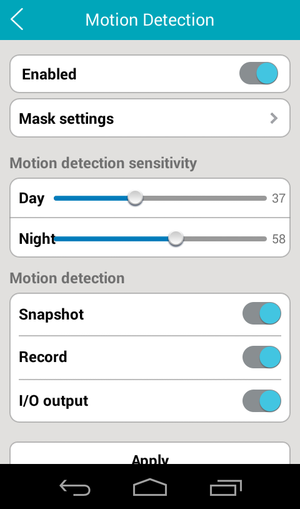 Most of the camera’s settings—including motion detection—are accessed through a gear icon at the top of the feed screen. Depending on which responses you choose, the P1 will begin recording video, take a picture, or both when it senses movement, and it will send a notification to your mobile device. Tapping the notification will take you directly to the camera’s live view. From there you can access the recorded video by tapping a button at the top of the screen. The app offers plenty of customization to keep false alarms in check. Alerts and recording are scheduled independently of each other, and you can define up to four different time blocks for each. 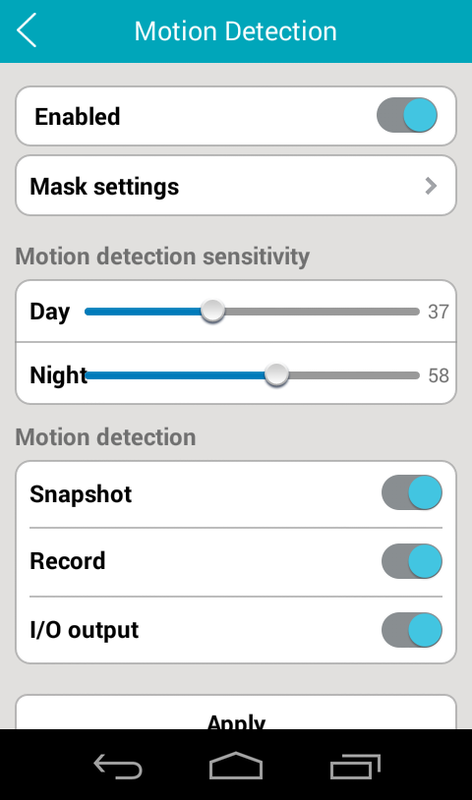 You can also mask portions of image to eliminate motion detection in those parts of the camera’s view. This makes it handy for homing in on ingress points like entryways and patio doors and filtering out other room elements that might inadvertently trigger an alert. The P1’s image quality is crisp with accurate colors and no fisheye distortion at the edges. The audio quality is also clear enough to hear what’s actually going on in the room. The 70-degree viewing angle is a little narrow—most of the cameras in our guide have viewing angles north of 100 degrees—but it’s adequate if you’re monitoring a single room in your home. The Vimtag mobile app allows you to mask parts of the image to define motion detection areas. If you need the camera to keep an eye on a bigger space, you’ll get ample use out of the P1’s pan-and-tilt feature. You operate it by swiping a finger across or vertically on your device’s screen in the direction you want the camera to move. After a moment’s delay, each swipe moves the camera incrementally through its respective range. Overall, the camera works remarkably well. The only hiccups I encountered were when using the web app. Sometimes I’d get a live feed when I logged in; other times, I get a black screen—and that was testing it on multiple browsers. Hit-and-miss functionality isn’t something you want to deal with when the security of your home or business is at stake, so stick with the mobile app until the web version’s kinks are worked out. In short, I really liked this camera. There was no particular stand-out feature, just a smooth, intuitive experience all the way around. Its ease of use makes it a great choice for first-time IP camera buyers or anyone else who wants a hassle-free security solution. The S1 Cloud Box is a nice option if you need 24/7 recording of a business location or other property, but for simple home monitoring the P1 and a $20 microSD card are all you really need. An excellent, easy-to-use option for first-time security camera buyers or anyone else who wants a hassle-free security solution.